A new telescope — VISTA (the Visible and Infrared Survey Telescope for Astronomy) — has just started work at ESO’s Paranal Observatory and has made its first release of pictures. 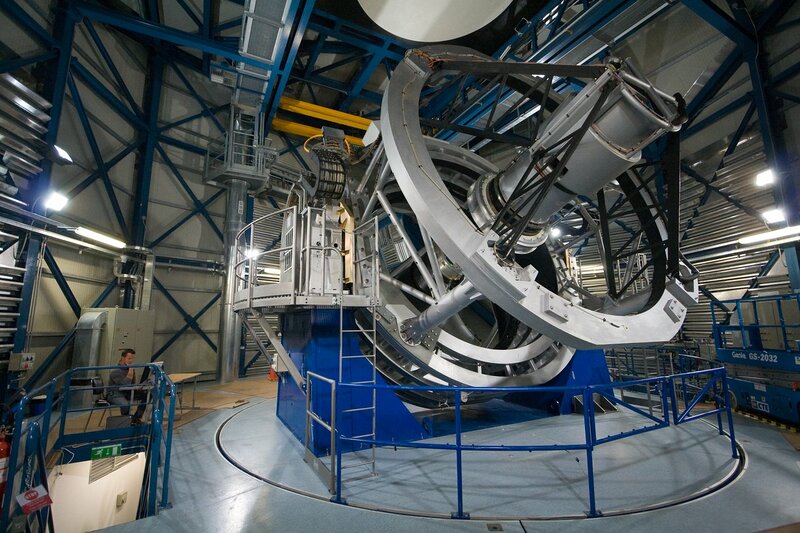 VISTA is a survey telescope working at infrared wavelengths and is the world’s largest telescope dedicated to mapping the sky. 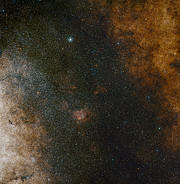 Its large mirror, wide field of view and very sensitive detectors will reveal a completely new view of the southern sky. 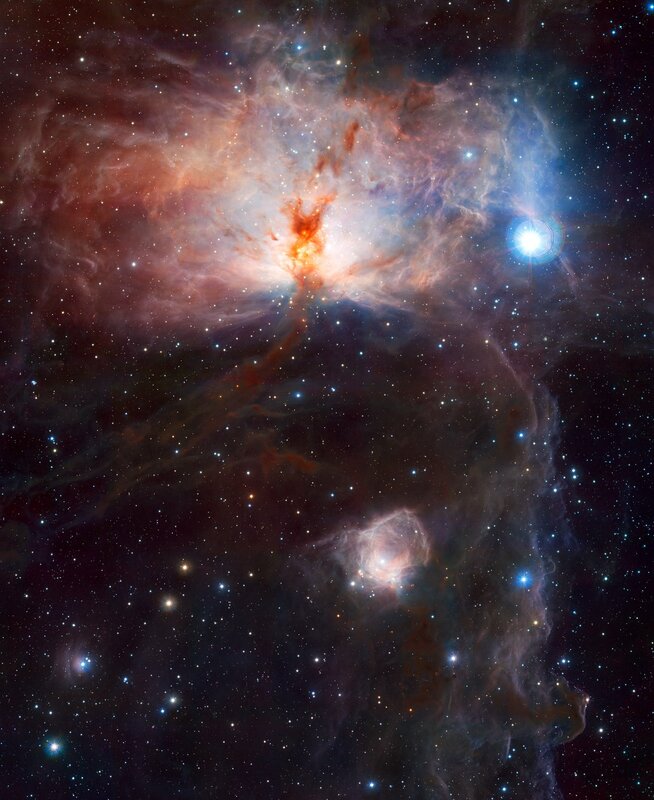 Spectacular new images of the Flame Nebula, the centre of our Milky Way galaxy and the Fornax Galaxy Cluster show that it is working extremely well. 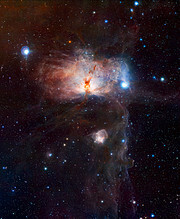 VISTA is the latest telescope to be added to ESO’s Paranal Observatory in the Atacama Desert of northern Chile. It is housed on the peak adjacent to the one hosting the ESO Very Large Telescope (VLT) and shares the same exceptional observing conditions. VISTA’s main mirror is 4.1 metres across and is the most highly curved mirror of this size and quality ever made — its deviations from a perfect surface are less than a few thousandths of the thickness of a human hair — and its construction and polishing presented formidable challenges. VISTA was conceived and developed by a consortium of 18 universities in the United Kingdom  led by Queen Mary, University of London and became an in-kind contribution to ESO as part of the UK's accession agreement. 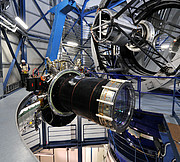 The telescope design and construction were project-managed by the Science and Technology Facilities Council's UK Astronomy Technology Centre (STFC, UK ATC). Provisional acceptance of VISTA was formally granted by ESO at a ceremony at ESO's Headquarters in Garching, Germany, attended by representatives of Queen Mary, University of London and STFC, on 10 December 2009 and the telescope will now be operated by ESO. “VISTA is a unique addition to ESO’s observatory on Cerro Paranal. It will play a pioneering role in surveying the southern sky at infrared wavelengths and will find many interesting targets for further study by the Very Large Telescope, ALMA and the future European Extremely Large Telescope,” says Tim de Zeeuw, the ESO Director General. At the heart of VISTA is a 3-tonne camera containing 16 special detectors sensitive to infrared light, with a combined total of 67 million pixels. 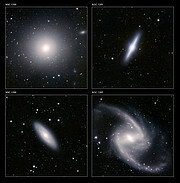 Observing at wavelengths longer than those visible with the human eye allows VISTA to study objects that are otherwise impossible to see in visible light because they are either too cool, obscured by dust clouds or because they are so far away that their light has been stretched beyond the visible range by the expansion of the Universe. To avoid swamping the faint infrared radiation coming from space, the camera has to be cooled to -200 degrees Celsius and is sealed with the largest infrared-transparent window ever made. The VISTA camera was designed and built by a consortium including the Rutherford Appleton Laboratory, the UK ATC and the University of Durham in the United Kingdom. 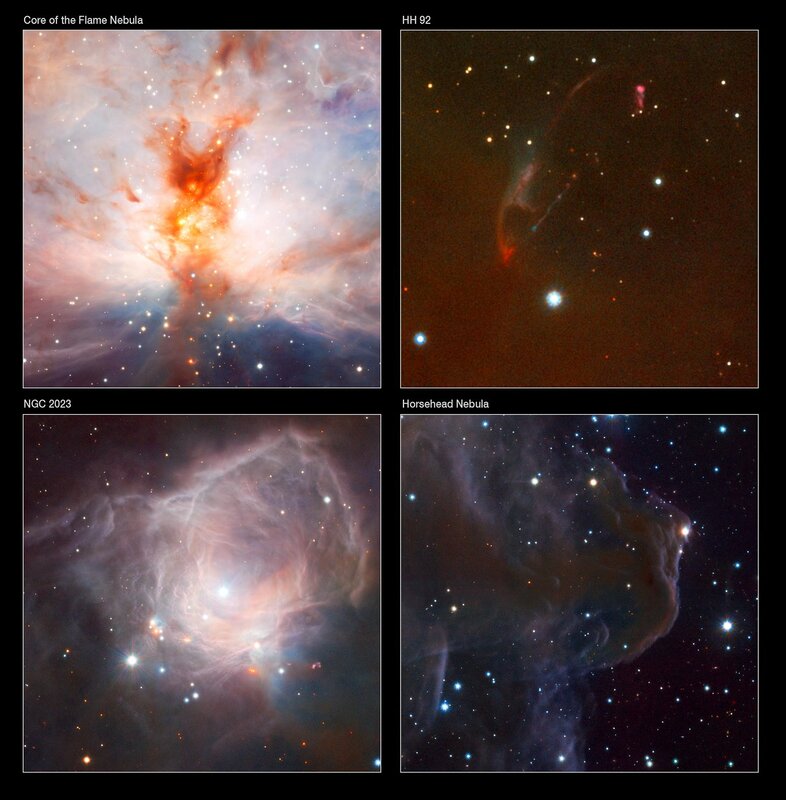 Because VISTA is a large telescope that also has a large field of view it can both detect faint sources and also cover wide areas of sky quickly. Each VISTA image captures a section of sky covering about ten times the area of the full Moon and it will be able to detect and catalogue objects over the whole southern sky with a sensitivity that is forty times greater than that achieved with earlier infrared sky surveys such as the highly successful Two Micron All-Sky Survey. This jump in observational power — comparable to the step in sensitivity from the unaided eye to Galileo’s first telescope — will reveal vast numbers of new objects and allow the creation of far more complete inventories of rare and exotic objects in the southern sky. 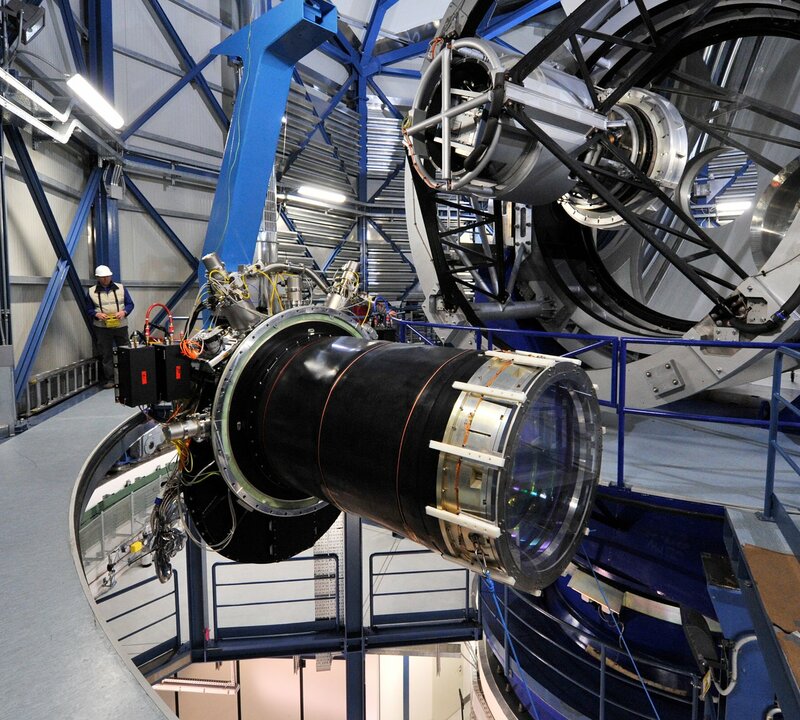 “We're delighted to have been able to provide the astronomical community with the VISTA telescope. The exceptional quality of the scientific data is a tribute to all the scientists and engineers who were involved in this exciting and challenging project,” adds Ian Robson, Head of the UK ATC. The first released image shows the Flame Nebula (NGC 2024), a spectacular star-forming cloud of gas and dust in the familiar constellation of Orion (the Hunter) and its surroundings. 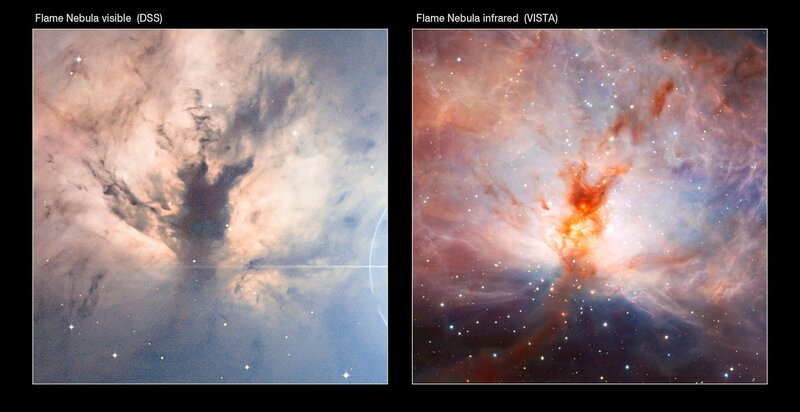 In visible light the core of the object is hidden behind thick clouds of dust, but the VISTA image, taken at infrared wavelengths, can penetrate the murk and reveal the cluster of hot young stars hidden within. 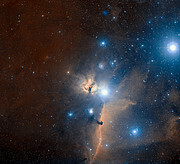 The wide field of view of the VISTA camera also captures the glow of NGC 2023 and the ghostly form of the famous Horsehead Nebula. The second image is a mosaic of two VISTA views towards the centre of our Milky Way galaxy in the constellation of Sagittarius (the Archer). 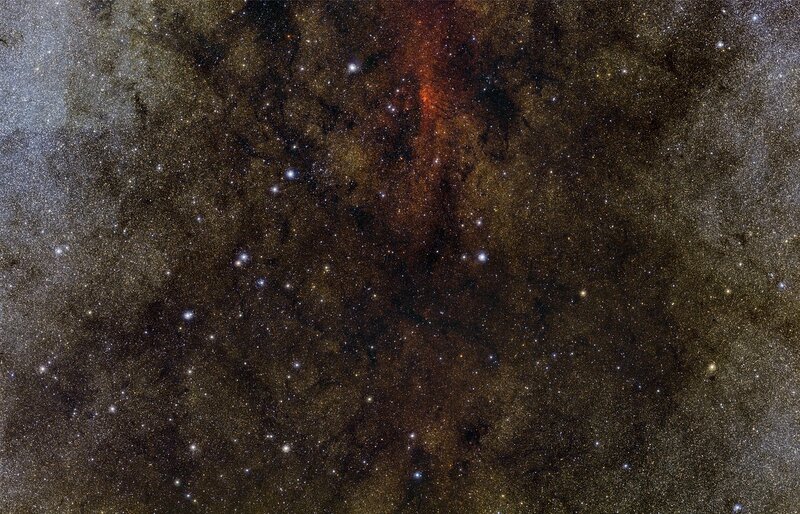 Vast numbers of stars are revealed — this single picture shows about one million stars — and the majority are normally hidden behind thick dust clouds and only become visible at infrared wavelengths. 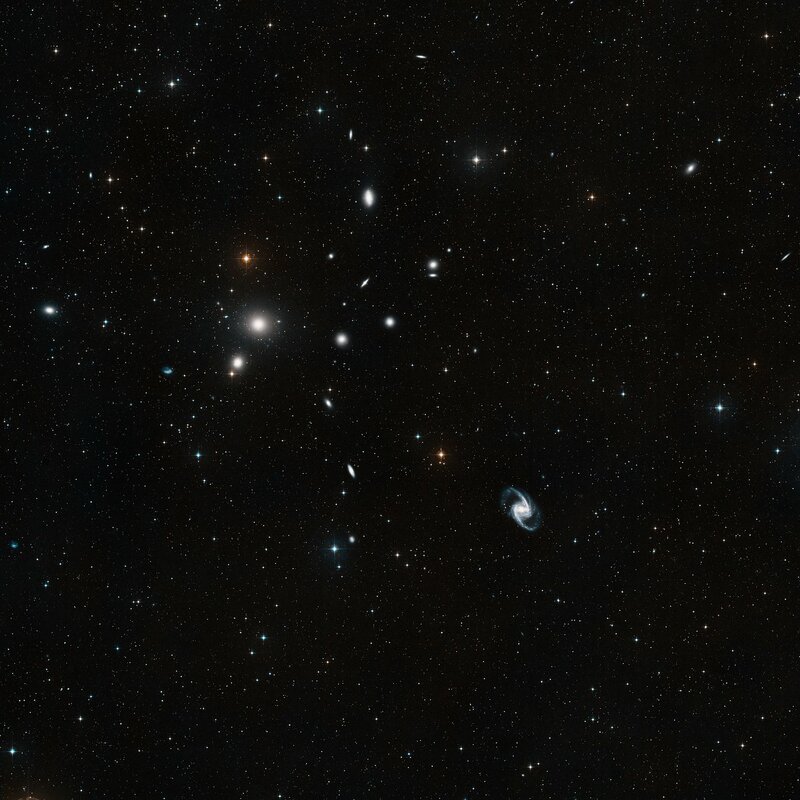 For the final image, VISTA has stared far beyond our galaxy to take a family photograph of a cluster of galaxies in the constellation of Fornax (the Chemical Furnace). The wide field allows many galaxies to be captured in a single image including the striking barred-spiral NGC 1365 and the big elliptical galaxy NGC 1399. VISTA will spend almost all of its time mapping the southern sky in a systematic fashion. 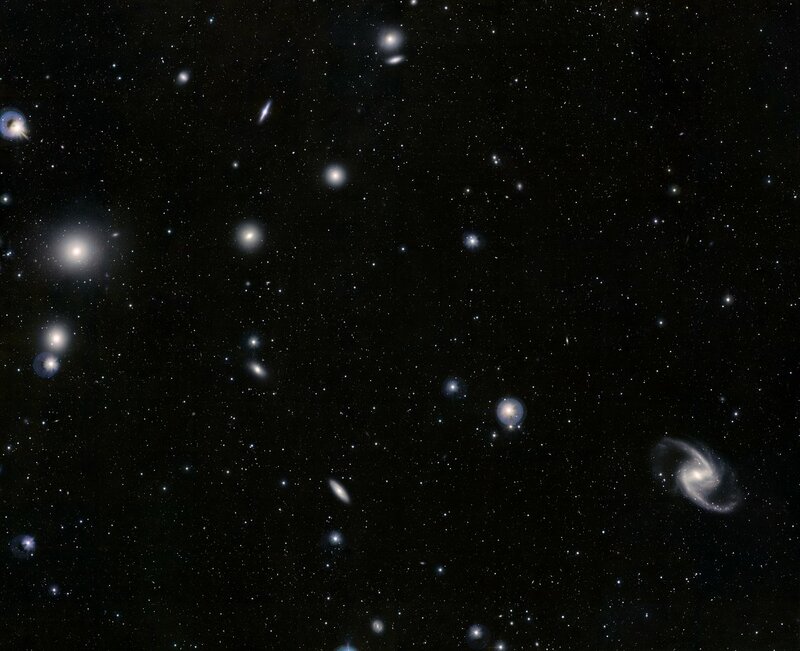 The telescope is embarking on six major sky surveys with different scientific goals over its first five years. One survey will cover the entire southern sky and others will be dedicated to smaller regions to be studied in greater detail. VISTA's surveys will help our understanding of the nature, distribution and origin of known types of stars and galaxies, map the three-dimensional structure of our galaxy and the neighbouring Magellanic Clouds, and help determine the relation between the structure of the Universe and the mysterious dark energy and dark matter. The huge data volumes — typically 300 gigabytes per night or more than 100 terabytes per year — will flow back into the ESO digital archive and will be processed into images and catalogues at data centres in the United Kingdom at the Universities of Cambridge and Edinburgh. 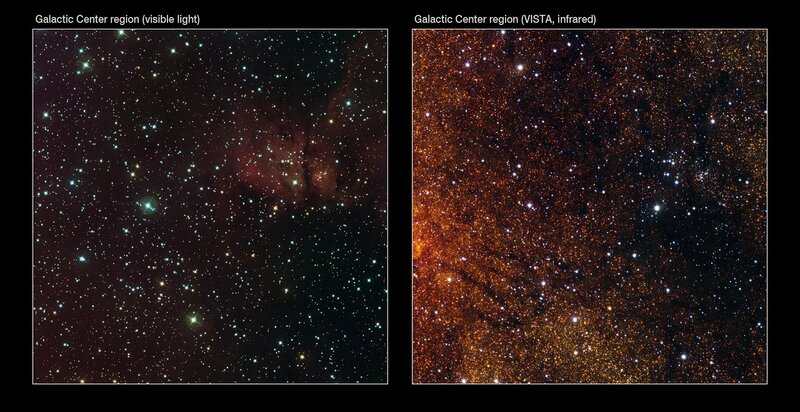 All data will become public and be available to astronomers around the globe. The VISTA Consortium is led by Queen Mary, University of London and consists of: Queen Mary, University of London; Queen's University of Belfast; University of Birmingham; University of Cambridge; Cardiff University; University of Central Lancashire; University of Durham; The University of Edinburgh; University of Hertfordshire; Keele University; Leicester University; Liverpool John Moores University; University of Nottingham; University of Oxford; University of St Andrews; University of Southampton; University of Sussex and University College London.